Day Two of eating on only £1 per day went quite well. I felt full and satisfied, if only a little bored or constrained by the lack of options. 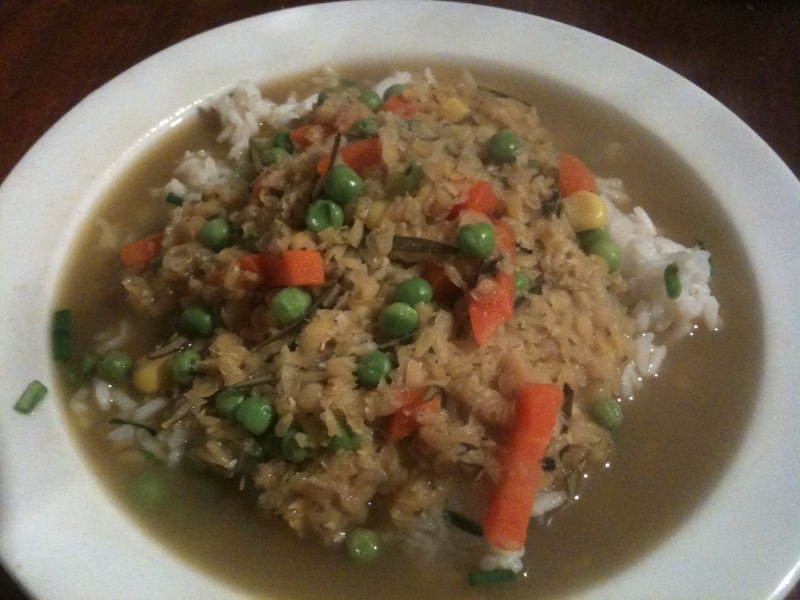 For lunch, I had the leftover lentil stew and rice concoction that I had made for dinner the previous night. Not great surprises in the recipe — lentils, water, salt/pepper and the frozen mixed vegetables for the stew and steamed rice — except for the fact that I could turn to my herb garden for a bunch of fresh rosemary and then also fresh chives for mixing in with the rice and over the top at the end. Having a herb garden has made a big difference already, and coincidentally home gardens are also one of the best ways to improve the nutrition of the rural poor. At an event held in Parliament by the UK Hunger Alliance on Monday Night, they launched a report which recommended home gardens as one solution fighting malnutrition (Did you know that among children under age five globally, 26 percent of them are stunted in their growth and 16 percent are underweight?). The home gardens supply them with a broader range of nutritious foods such as leafy vegetables, eggs or poultry meat for their families but also — if there is extra food leftover — they can sell the surplus food to make some extra money. As I sat at the pub with a glass of water in my hand, my friend Emily graciously tried to convince me that her buying me a pint would be the equivalent of a friend or family member helping someone out if they were short on cash one week. What awesome friends I have, as it wasn’t the first such offer (and a great reminder of the importance of informal “safety nets” for the poor). But I declined the offer and made my way home to cook dinner. At a stretch,this recipe is like breakfast for dinner. 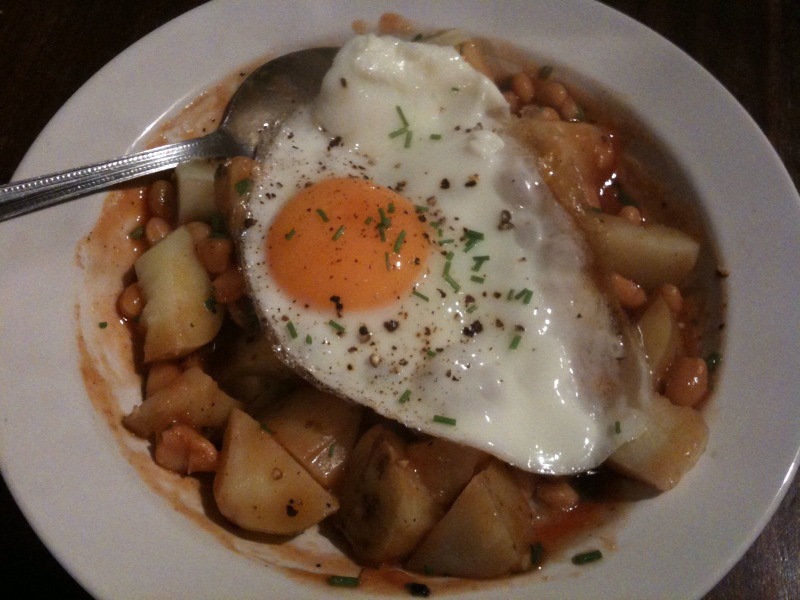 I boiled some potatoes and mixed them with half a can of baked beans and then dry-fried an egg which went on top along with some more of my fresh chives. It was actually quite good. Thanks for all the nice emails so far. Feel free to leave comments below as well!